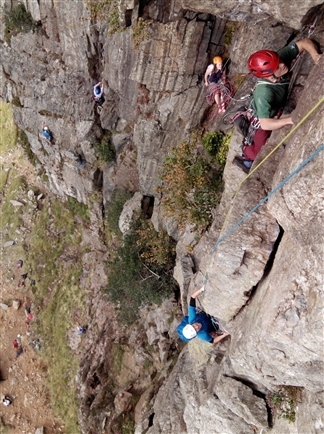 The North London Mountaineering Club is give you a try of climbing on rock, and now this club will host a new members meet to introduce potential new member to the world of climbing outdoors in North Wales on September 17 & 18. The NLMC is a BMC affiliated London and countrywide club celebrating its 60th year. It has a long history of climbing and mountaineering and hosts regular meets around the country and in the alps. Club members mostly climb trad but there are also sports climbing, bouldering, mountaineering and winter / ice climbing meets. New members normally live within the M25 which enables cost effective and eco friendly lift sharing. At a new members meet you’ll be hosted by an experienced member who will take you to a variety of venues and climb classic routes as either a roped pair or three. There is no minimum grade of climbing ability required, just bags of enthusiasm and competence belaying. The climbing style is mostly trad where the leader will place protection in the rock as he or she climbs. When the leader is secure at the top, he or she belays you up. As a second, you remove the protection as you climb: your leader will show you exactly what to do. If you are already an experienced outdoor climber, no problem, you are still welcome. We’ll partner you up accordingly. Accommodation is in the club hut, Bryn Bethynau in Capel Curig. It is comfortable and fully equipped with showers, kitchen, wood fired stove in the living room and alpine bunk style beds upstairs. The cost is free to members and £6 per night to non-members. If you’re interested to take part, check out the NLMC club forum post for further details. Forum membership is open to non-members so get signed up and get involved.